If your caseload is anything like mine, you will have tons of kids who have difficulty understanding humor and/or inferences. This is why I was really excited about "The Riddle Show" by Educational Insights. 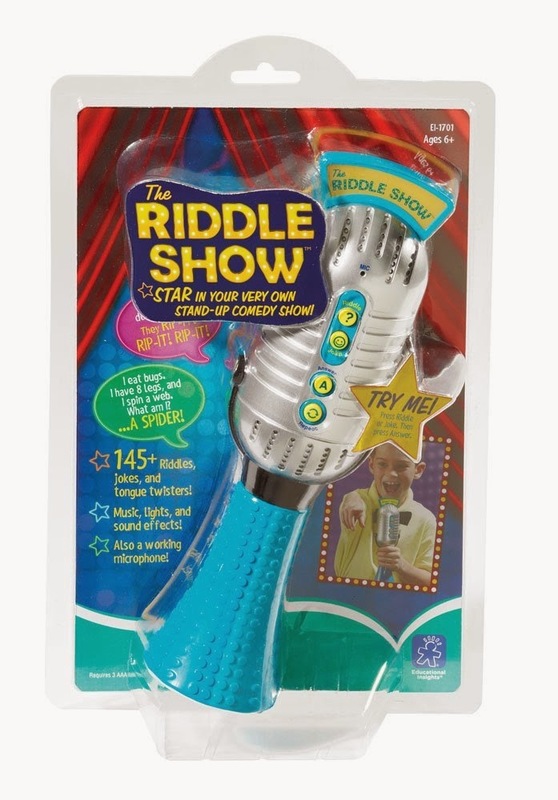 "The Riddle Show" is an electronic toy shaped like a microphone that tells a variety of riddles, jokes, and tongue twisters at the push of a button. Perfect for an SLP's caseload! And of course, because it is quite different from the usual picture cards, the kids loved it! The microphone essentially has four buttons that serve the following functions: (1) Tell a riddle, (2) Tell a riddle joke or tongue twister, (3) Answer, and (4) Repeat. The riddles are a set of clues that students have to guess a "mystery item" for. An example might be, "I eat bugs. I have 8 legs, and I spin a web. What am I?" To check the answer, students press the answer button. On the other hand, the riddle jokes are something along the line of "What do frogs do with paper?" - "Rip-it, rip-it, rip-it" (again, students press the answer button to check). At random intervals, the joke button will also yield a short tongue twister (e.g., Jolly jugglers juggle jacks). If you need the item repeated, you simply press the repeat button. Overall, the microphone plays a variety of 145 of these. As a bonus, the microphone actually works (think along the lines of the toy microphones you can purchase at the dollar store that make your voice echo)! It also lights up and has some silly sound effects. "The Riddle Show" runs on 3 AAA batteries, which are included in the initial purchase and is recommended for ages 6 and up. My students really liked this, and even though they didn't get the jokes, they couldn't get enough! One drawback was that the volume was somewhat soft (even at the "high" setting). However, I used this to my advantage, as it really forced my students to listen closely. This is a great toy to pull out once in a while to work on these targets!